AUSTRALIA's playing host over the next few months to one of our most unusual maritime visitors, the diminutive 6,800 tonne MV Doulos that's the world's oldest active ocean-going passenger ship. And while several hundred thousand of us will go aboard for a bit of a sticky-beak as she works her way from Brisbane to Fremantle between now and November, it's unlikely that any more than a handful – if even that – will take up an invitation to sail on her. That's because this classic little liner, that was originally launched as a freighter in 1914, is no longer a cruise ship – she's the world's biggest floating book fair from which have been sold more than 15-million books in 20 years, providing funds to allow her to give away many more times that number to worthy causes. Owned and operated by Germany's non-profit charity GBA Ships e.V, Doulos plies the oceans of the world to distribute books and literature resources to the under-privileged, provide medical aid, distribute food and clothing, help with construction projects, encourage inter-cultural understanding, and enthuse young people into becoming more effective in life and service. And while a major task is to also spread the message of Christianity, Doulos' 330 volunteer crew and staff – from her Australian Captain, Ashley McDonald through to her doctor, engineers, radio operators, seamen, cooks, waiters and laundrymen – do so without "Bible bashing" those they come in contact with. Doulos was built as the cargo ship Medina in Newport News, USA in 1914 and worked the American coast over the next 34-years, being sold then to a Panamanian company that converted her into a 1000-passenger ship re-named Roma to ferry pilgrims from South America to Italy and back for the 1950 Roman Catholic Holy Year. Afterwards Roma brought migrants from Europe to Australia, but that short career ended abruptly when she was arrested in Newcastle and laid-up for a year over a dispute about bills. 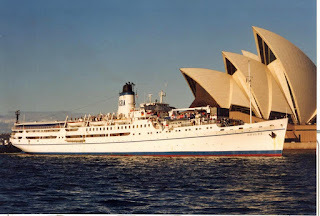 When finally released she was bought by Italy's Costa Line and re-named Franca C to carry holidaymakers between Italy and Argentina, before being remodeled yet again into a luxury First Class liner to ply the Mediterranean – and in the 1960s to pioneer the ultimately lucrative cruise market out of Miami, Florida. She was sold by Costa in 1977 to Germany's charitable Good Books for All (subsequently renamed GBA Ships e.V.,) and this time re-named Doulos – Greek for "slave." She's sailed over 350,000 nautical miles, and visited 600 ports in 100 countries in Europe, the Middle East, Africa, the Americas, Asia, and the Pacific. More than 20-million people have visited her library and shopped at her book fair, toured the ship, and enjoyed cultural performances and displays by her 40-nationality officers and staff who, while not doing voluntarily aid or construction work, do similar shows ashore for charities, elderly peoples' homes, schools and hospitals. Captain McDonald, then an Australian Navy officer, and his wife Alison a speech therapist, met in Darwin and married in 1955. They were living in Fremantle when Doulos first visited there in 1999 and were amongst over 200,000 who toured this unique vessel during her first Australian tour – and a year later with a 21-months old daughter, accepted offers for Ashley to become volunteer 2nd Officer and Alison a voluntary speech therapist. 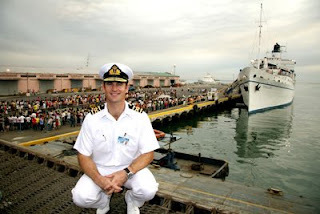 After four years aboard they returned to Fremantle where Ashley rose to Deputy Harbour Master, before in 2005 being invited to this time become Doulos' Captain. "I didn't need to read that email," Alison recalls. "The look on Ashley's face told me everything." Captain McDonald tossed-in a 6-figure salary to work for free as Master of Doulos, while Alison abandoned her own career to once more work as a volunteer speech therapist on board and at ports they would visit. Now, with three daughters, like all others aboard they not only work for free, but raise funds to support themselves and Doulos' running, charitable and religious work. Although of the latter, as the Mayor of Catania in Italy says: "Those on Doulos don't speak about religion – they're an expression of it." DOULOS off Sydney Opera House on a previous visit in 1999. 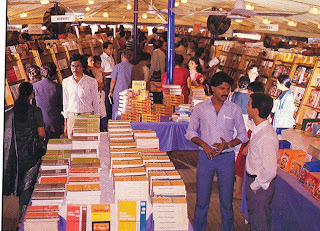 BOOK a place – visitors to Doulos' vast library and book fair that sells and donates books to worthy causes. Captain Ashley McDonald with Doulos in the background.